The Ranger player seems like he must be #27 Mike McEwen as a #2 is clearly visible on the sleeve and and a #7 is visible on the back of the jersey. 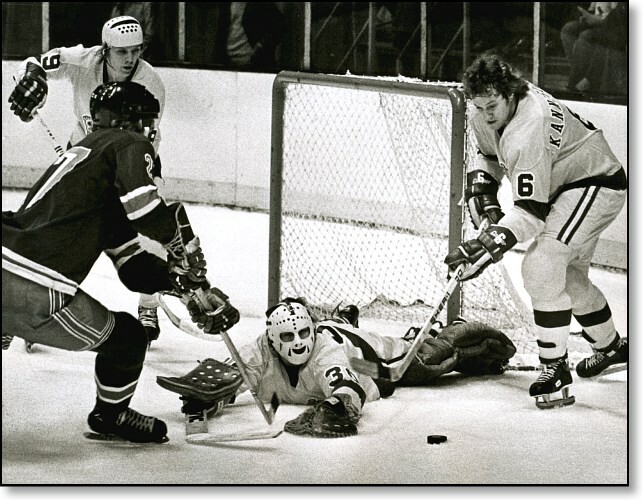 Mike McEwean wore a helmet and there was no #2 on the Rangers in 1976-1977. The other LA Kings are Butch Goring, Sheldon Kannegiesser & Rogie Vachon. Some friends and I have looked at this further. In the ’76/’77 season, the Rangers wore special new jerseys and pants that are very different to the the traditional one shown in the photo. So, is there a chance that despite the copyright notice, the photo was actually taken in calendar year 1975? If so, Dale Lewis wore #27 for a shot stint with the Rangers and they visited LA to play the Kings Nov 8, 1975. The player in the photo is also a left-hand shot but it appears from the records that Mike McEwen shot right. So, it looks like we are down to two options. If the game in question was in 1975, its Dale Lewis. If it’s not the Rangers, it’s not an NHL team. No one other than the Rangers had pants with that stripe pattern or jerseys with those stripes and drop-shadowed numerals. Ken, it’s definitely possible it was 1976. The Rangers wore those jerseys during the 1975-76 season, and played the Kings in LA on March 11, 1976. The only catch is whether Dale Lewis was on the team at the point or someone else was wearing no. 27.